On October 20, 2018 (Saturday, 1 p.m. Eastern Time) I’ll be giving a webinar with Alison Lee on Craftcast. 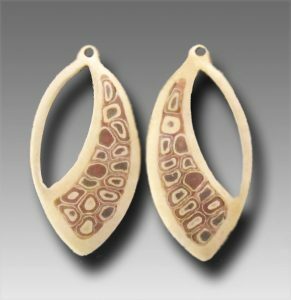 I will be teaching how to make earrings with patterns of color (mokume gane) using three types of metal clay. The class also includes two documents that I have prepared: one is a collection of questions and answers about patterns of color, and the other illustrates what goes on inside the extruder. To sign up for the class please click here. For beginners who want some preparation before the class I’ll be teaching an introduction workshop at Abrams Claghorn Gallery in Albany, CA on October 6 and 13. For more information on this workshop please click here. This entry was posted on Tuesday, September 11th, 2018 at 2:38 pm. You can follow any responses to this entry through the RSS 2.0 feed. Responses are currently closed, but you can trackback from your own site. Because of differing conditions, tools, and individual skills, the author cannot be responsible for any loss, injury, or other damage that may result from the use of the information in this blog. Copyright © 2013 Hadar Jacobson. All rights reserved. Hadar's Clay is a trademark of Hadar Jacobson. The terms "bronze clay" and "copper clay" are used generically and do not denote any particular product or brand.